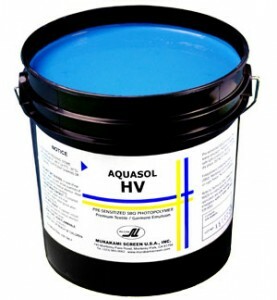 Murakami Aquasol HV - RC Screen Shop & Supply Co.
Murakami Aquasol HV has a higher vicsosity for thicker stencils, fast exposures and highly durable stencils. SKU: MKS-AQHV. Categories: Emulsions & Accessories, Murakami. Tags: murakami, pure photopolymer, emulsion. Murakami Aquasol HV has a higher vicsosity for thicker stencils. Fast exposures, and highly durable stencils provides non stop production on press. Use as is for sharp plastisol prints, or it can be made more water resistant with the addition of diazo or application of Murakami Hardeners.